The first specific point to be considered is the case which, in order to be considered durable, must be made of steel with a single sheet of bent sheet metal, thus creating a one-piece structure. Some of the cheaper cabinets are made using several pieces of sheet metal, joined together by means of simple welding points. 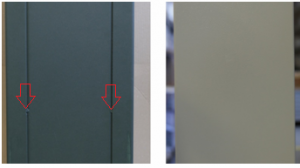 On the left is a case made of several pieces of welded sheet metal (the arrows indicate the small welding points); on the right is a cabinet made with a single bent plate. The case must be fitted with holes to allow the cabinet to be fastened to the wall. In fact, even though their weight might be enough to prevent their removal, it is recommended that security cabinets be fixed to the wall using anchor dowels, just the same as for free standing safes. It is important that the anchor dowels are very large and fitted with pull-resistant tabs, and that they provide maximum resistance according to the type of wall. A chemical anchor dowel is recommended. The door houses the locking mechanism; for this reason, since it is a particularly critical aspect for the security, it is important to have some security features: material and thickness. The door, like the case, must be made of a strong material, such as steel, and it is worth having a thickness greater than that of the case. Also, in order to resist unhinging and breaking in it is essential that the hinges and pins are also manufactured with excellent quality steel and that, as well as being sufficiently large, they are joined to the case and the door with strong welds. Just like the doors of safes, the doors of security cabinets must also rest along all sides on special attack-proof ledges made in the frame. 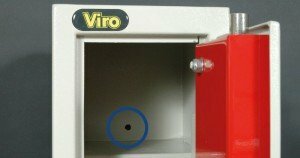 The frame, unlike those of safes, is typically made using the same sheet of steel with which the case is made, and appropriately bent. 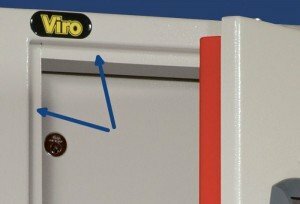 However, when additional security is required, even cabinets can be fitted with frames with an increased thickness welded on the inner part of the front, just like for safes. If the cabinet is electronic and it is fitted with an opening knob, it is important that this has a programmed breakage point, so that if an attempt is made to force open the cabinet by forcing the knob this breaks without damaging the internal mechanism and without leaving space for the introduction of any burglary tools. Regardless of the type of lock, whether it is mechanical or electronic, in order to guarantee the resistance to attacks it is important that the internal mechanism is made completely of steel, without any plastic parts. In the next blog we will talk about what accessories / optional extras can be installed on security cabinets; after all, who doesn’t want an attractive cabinet which is easy to use, as well as being resistant?